Review It’s a sad fact that as the picture quality of flatscreen TVs have been steadily improving, their audio performance has been dropping off. This is mainly due to the fact that TVs are becoming slimmer and slimmer, leaving less room for decent sized speakers. If your other half won’t hear tell of a surround sound systems and all the associated cables, then a soundbar might provide a more harmonious route to beefier audio from your TV. 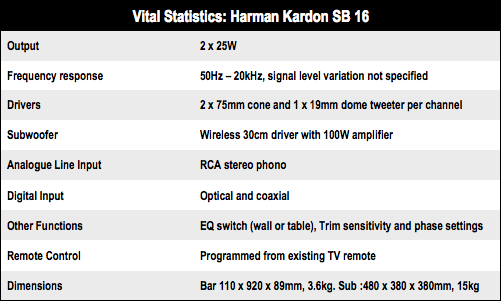 Harman Kardon’s SB 16 includes a main soundbar as well as an active, powered subwoofer. 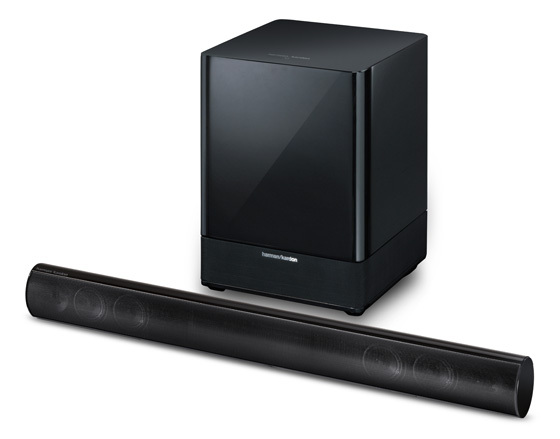 The main soundbar is around 92cm long and packs in six speakers – four drives and two tweeters. Finished in glossy black plastic with a black metal grille protecting the speakers from harm, it should blend in nicely with the design of the majority of today’s TVs. Unlike most soundbars, though, there’s no LCD display on the front so you don’t get any indication of the current volume level that it’s set to. The main unit connects wirelessly to the active subwoofer. This is also finished in glossy black plastic, but it’s absolutely huge measuring 48 x 38 x 38cm. Nevertheless, the fact that it’s wireless means you should be able to place it out of sight. Unfortunately, the SB 16 lacks any HDMI ports, but around the back you’ll find both coaxial and optical digital inputs as well as a pair of stereo phono connectors for connecting it up to your various bits of AV gear. You won’t find any remote control in the box, either. Instead, the system can be programmed to respond to your TV remote’s volume, source and power buttons. Setting up remote control is initially a bit tricky, but it should only have to be done once, so it’s not really all that much of a headache. The idea is that you disable your TV’s internal speakers, so you’re left with one remote to control both the TV and the soundbar, but not all TVs allows you to do this, so for some people it won’t be as slick a solution as Harman Kardon seems to believe. Review Providing directions, or just leading you on?